One of my favorite perennials, and a mainstay of my garden for over a decade. Useful as a background specimen, it’s a native of North America, easy to grow, very pest and disease resistant, and lives for upwards to twenty-five years. In bloom right now, False Indigos are a striking plant, very different, with rich blue, pealike flowers on spires ranging from two to four feet. It develops slowly into a bushy clump. Blooms only last a few weeks but the foliage remains attractive all season, particularly if the plant is deadheaded (no significant re-bloom). 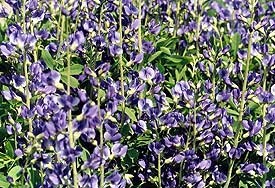 False Indigo is very carefree. It takes three to four years for the plant to bloom from seed, and two years to bloom when purchased as a young potted specimen. Mine still wasn’t blooming after four years, until I learned the plant does not bloom well in acidic soil. For the first time in my life, I added lime to my garden soil, around the plant, in the fall, and next spring it bloomed. I have repeated light lime treatments each fall, with success. Though listed as full sun, the plant performs well in as little as three hours of direct sunlight per day, provided it is midday sun. It will bloom more heavily in full-sun locations. An inch of water per week is fine; it is actually quite drought-resistant. Tolerant of most soils. It has a very deep, fleshy root system and whereas the plant does not require dividing, if you do so, be prepared to dig very deeply and ultimately cut off stubborn roots with a bypass pruner. You could tether a dirigible to a mature clump. Divide in early spring. False Indigos combine well with anything. Pre-bloom, during bloom, and after bloom, they look like nothing else.